One of my delight of spring season is to see flower of tulip. 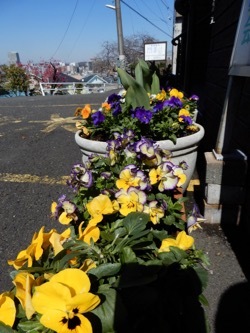 There are some planters in front of our church, tulips are growing among flowers of viola. I planted them last autumn. However, when I saw these flowers, I have mixed feelings. I will move to another church next week, so I will not see these tulip flowers. It's pity that I can't see the flower that I have planted. After thinking about it, much of what we have is not something we have made myself. 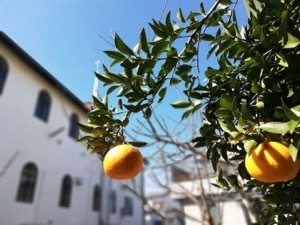 For example, I harvested orange which was planted in front of my house last week. It was not planted my own. Probably it was planted by a former pastor. Actually I didn't plant it, but I was able to eat orange every year. I was baptized 35 years ago. But I did not find God by myself. And I was not baptized by myself. Someone sowed the seed of Gospel for me, so as a result I was able to believe God. I will work as a pastor at Kitaura Saniku Junior High School and Church from this April. That's where I was baptized 35 years ago. I would like to sow the seed of Gospel like someone sowed for us 35 years ago. And I want to say thank you very much to you. Because you have read these article every week and support for me during these 6 years. May God bless you!